Every year, college sports generate billions of dollars. The NCAA is not just an athletic association; it’s an industry, and it creates massive amounts of revenue for schools, broadcasters, and coaches. In fact, the only people who don’t profit from college athletics are the athletes themselves. This is, quite frankly, an injustice that cannot be allowed to endure any longer, and the only course of action is clear: It is time to start paying college athletes, or at the very least start giving them coupons to P.F. Chang’s. Think about it: The entire college athletics industry is powered almost exclusively by the athletes, yet the very people selling tickets and driving up broadcast ratings will never see a single cent of the money they help generate, nor can they expect to receive a single voucher for half off any drink at P.F. Chang’s with an order of three or more Wok Classics. This has to change, and soon. It’s just basic common sense. These kids are bringing in millions of dollars to their schools, and they deserve a base salary of $100,000 a year or at least half off on any three side dishes with the purchase of an entrée at P.F. Chang’s. The NCAA needs to start taking care of the kids who keep the organization in business. If you’re the director of an elite collegiate athletic program and you’re not sure if you can afford to pay all of your athletes, then maybe you should forgo that expensive new facility and channel some of that money into a fair wage for them. Is your school far away from the nearest P.F. Chang’s establishment? Then you should invest some of your enormous annual profits into shuttles to transport your athletes to and from the location, no matter how long it takes to get there. This is a right that they have earned with their blood, sweat, and tears. We also can’t overlook the fact that these athletes are putting themselves at great physical risk by playing these sports. Injuries are incredibly common in college athletics, and if athletes are injured while playing sports for their school, they should expect to receive substantial workers’ compensation or to remain enrolled in the P.F. Chang’s Preferred rewards program. It’s a matter of human decency. 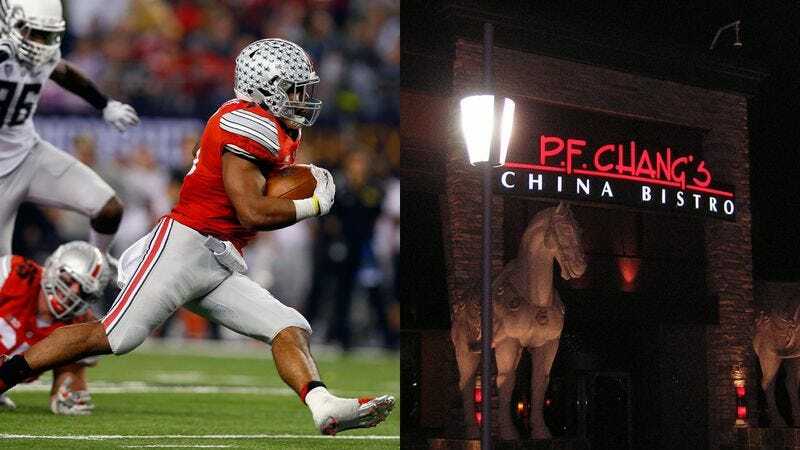 Injured college athletes need to know that even if they can’t play for their schools, they can still expect to receive 10 Chang’s Points for every dollar they spend at participating P.F. Chang’s locations. Any American who believes in labor equality would agree. Because let’s not mince words: This is a labor issue. College athletes are working for their schools, and this work must be compensated with a salary reflective of the significant contributions they make to their programs or at least a voucher for half off one order of Chang’s Spicy Chicken on weekdays before 7 p.m. The way forward is simple, and we cannot wait any longer. We must pay college athletes NOW, or, barring that, we must give them coupons to P.F. Chang’s or maybe Fuddruckers. It’s time to make a change.